Have you ever dreamed of working in the lingerie industry? 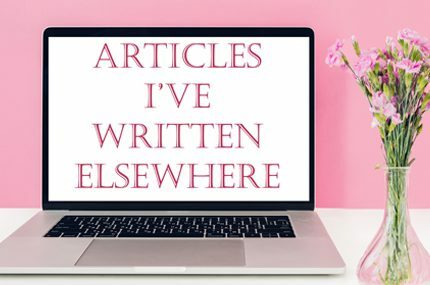 If so, then this new blog series is for you! I’m excited to announce Careers in Lingerie, which will be an ongoing series providing a behind-the-scenes look at different jobs available to those with a passion for underthings. Designing bras, modelling, styling, launching your own lingerie label… all of these things can seem super glamorous, but the truth is that every job has its negatives as well as its positives and will appeal to different types of people. Through speaking with people actually working in these roles, I hope to give you a little insight into what it’s like to do it for a living and which skills, qualifications and experience can help you get there, so that you can decide which lingerie-industry career is the right one for you. Oh, and if you’re just plain curious about what these jobs are really like, this series is for you too! I’m kicking the series off with one of my favourites: independent designer. Ayten Roberts is the designer behind Ayten Gasson, a luxury, British lingerie and nightwear brand that specialises in silk products. She runs her brand full-time – Ayten Gasson has been around for over a decade now, and as of just a few months ago has a brick-and-mortar boutique in Brighton as well as the online store. Since the launch, the lingerie is all now sewn on the shop floor so that local customers can see exactly how it’s made. Estelle: Hi Ayten! Welcome to the blog. Today we’re shedding some light on the life of an independent designer for those who are considering pursuing their own lingerie brand. Let’s start with the beginning of your career – what did you study? Ayten: I started off with a BTEC diploma in Fashion at London College of Fashion and then a 4 year BA (HONS) in Fashion Print at Central Saint Martins. 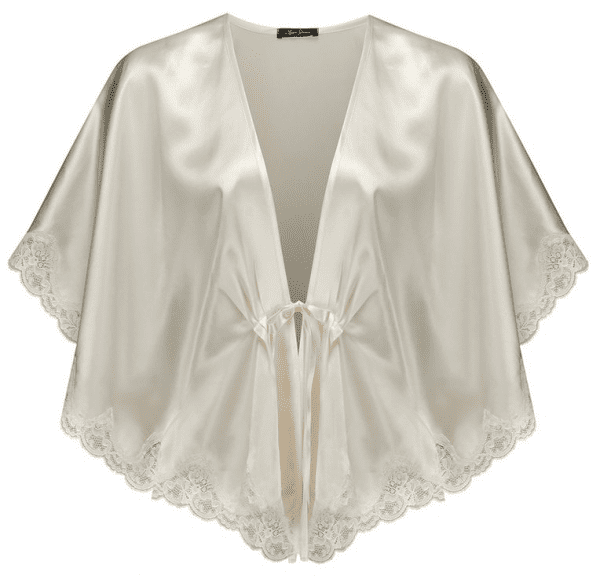 I had always planned on a career in textile design, but found I preferred working with lace and appliquéing onto silk. I worked in Knickerbox – a high street underwear shop which has since closed down – while studying, and that’s where my passion for lingerie grew. It was frustrating trying to sell lingerie which was made from cheap polyester fabrics instead of silk and cottons, so I researched into vintage lingerie, handmade laces, the old lace industry in Nottingham and the benefits of silk. E: Would you recommend a similar course for budding lingerie designer-makers? A: One of my assistants studied at De Montfort University and I am very impressed with the courses they have to offer. I would suggest anyone who is interested in lingerie design look into these courses. E: Walk us through what a typical day in your boutique-studio looks like. Because I’m sure it’s not just sewing pretty knickers all day long, as lovely as that would be! 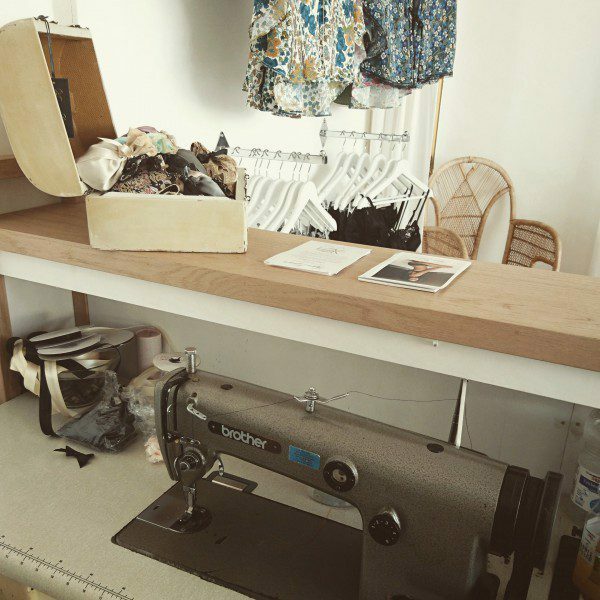 A: My day-to-day routine has changed drastically since May 2016, when I opened my first boutique in Brighton. My studio is now within the shop, so I work around my customers. I am based in Brighton’s Seven Dials, which is quieter than the centre of town, so I am able to do that. I usually get in for 9.30am, giving me time to set up the computers and the till, and do a quick bit of cleaning before I open at 10am. I then check emails, and pack any web orders which have come in overnight. I then focus on sewing and restocking the shop. I now make all the lingerie which is on our website so I have to keep up to date with which pieces have sold, how much fabric I have available from that range and how long it takes to make each piece. I am able to focus on my customers when they come into the shop and offer a one-on-one service to help them find what they are looking for. I also sell a selection of gifts, such as stationery, cosmetics and candles from other UK independent designers, so I have to make sure I restock and keep an eye on my best sellers so I don’t run out. E: What are your typical working hours running Ayten Gasson? Do you stick to 9-5? A: I open the shop at 10am and close at 6pm every day except for Sundays and Mondays. If I am very busy or have had a busy weekend I will open on a Monday too so I can use the studio space. E: Is there anything that your work entails that surprises people, or that most people wouldn’t know is part of the job? A: There is so much admin! I have an accountant, but there is still so much to keep on top of. I have several boxes around the till area filled with receipts, delivery notes and invoices. I am surprised by how many licences you need once you open a shop, and have a special section under the till for official letters! E: What do you love most about being an independent lingerie designer? A: I really love sewing and creating my lingerie. It is the best part of my day, and something I missed when I worked with UK production houses and factories. Some people are makers, some are more business-oriented, some are both. I definitely enjoy the making more than anything else. E: And what do you dislike? A: The admin side of things and trying to keep track of all the bills coming in and the invoices going out, especially now I have the website and the boutique. It feels like they are two completely different businesses and I am still getting used to that, even though it has been 4 months. E: Qualifications aside, what do you think it takes to become the owner of a successful lingerie brand such as Ayten Gasson? A: I have worked in retail since I was 16 years old, so that’s 20 years of customer service. I feel it’s important to make a customer feel like they are getting the best service and the attention they deserve, whether they are ordering online or in store. I have had customers email me to tell me they have been impressed with the service we provide and I have already received some great reviews on Google and Yell.com. I feel this is very important, as there is no point designing a great product or having a flashy website if your customer service is lacking. E: So, the million dollar question, would you recommend to aspiring designers that they pursue a career as an independent designer over working for a large brand, and why or why not? A: Try to get as much experience as possible. Every company works in a different way, so try to explore all the different aspects of working in lingerie and see which is best for you. E: Thanks for being part of my Careers in Lingerie series! 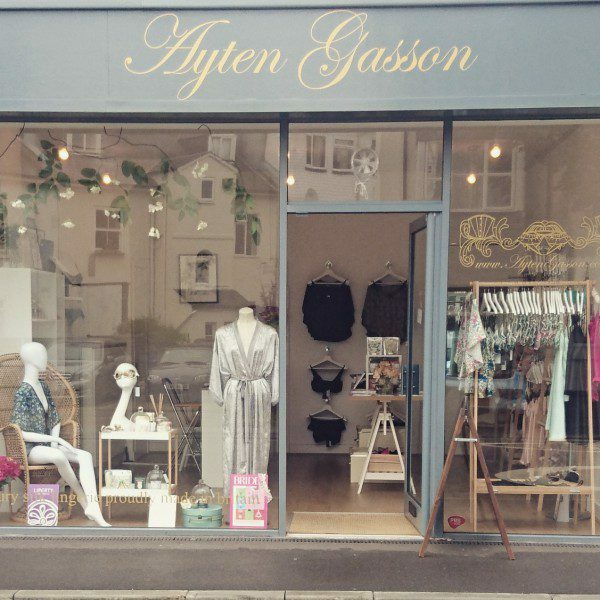 You can find Ayten Gasson’s online boutique here, and follow the brand on Twitter, Facebook, Instagram or Pinterest. 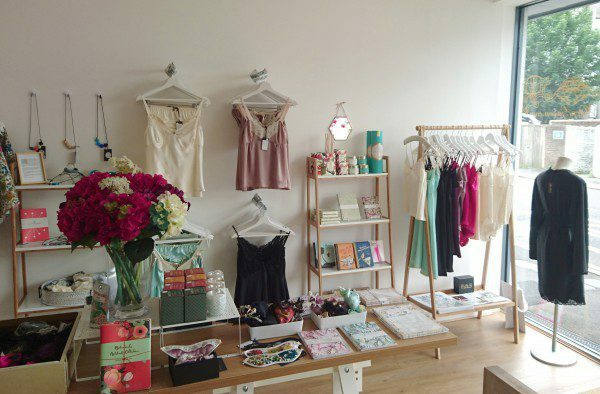 Her boutique is located at 32A Bath Street, Brighton, BN1 3TB, near to an antiques shop and a vintage interiors boutique. 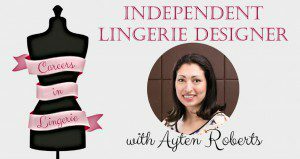 If you have any other questions for Ayten about what it’s like to be an independent lingerie designer, pop them in the comments section below. I’d also love to know which other job roles you’d most like to see covered next!